The pathways around your home aren’t just about getting from one point to another. They can and should be a beautiful part of your property’s design. 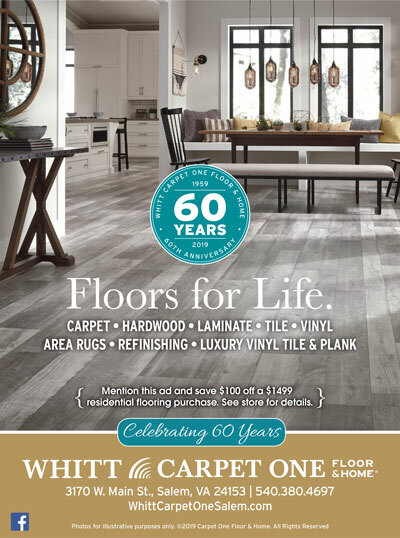 But with all the options out there, it can be hard to decide exactly what the best choice for your home and lifestyle is. We talked to local experts to get their advice on creating steps and pathways that are safe, durable, and—of course— attractive. 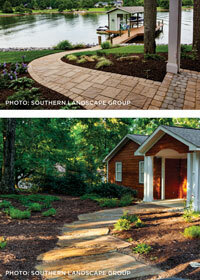 Before beginning any landscape project, set aside time to talk with your designer. Their experience is invaluable for making the right decisions for your property, style, and budget. But, he adds, it’s also important to consider how you want to use your property so you don’t find yourself redoing costly design decisions. If, for example, you might later add a pool or a space for children to play, let your designer know so they can lay out pathways with those elements in mind. No matter what your overall budget is, it’s important to understand the costs of the individual elements you choose. Your designer should be able to suggest multiple options to achieve your preferred look at different price points. They can also help you find less expensive sources for materials, says Maslow, who recommends looking for deals from local stone yards that are trying to liquidate extra stock. 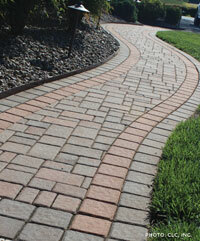 You also need to consider the cost of maintaining or replacing your walkways in the future. “Depending on the type of pathway, you may expect some maintenance from it,” cautions Maslow. No matter your age and physical ability, it’s important to create paths that allow you to move safely. Sloped paths are harder to walk down than steps, and narrow pathways can be awkward for more than one person at a time. To make the best use of your property, Maslow recommends keeping pathways at least 54 inches wide and using a combination of flat paths and stairs. Another important safety factor, and one that many homeowners overlook, is good lighting. If you install outdoor lighting next to all your pathways, especially on slopes or by steps, you’ll be able to use your property at any time of the day or night. 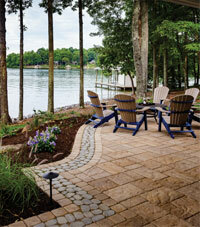 Many factors go into choosing materials for steps and pathways, including style, durability, safety, and cost. 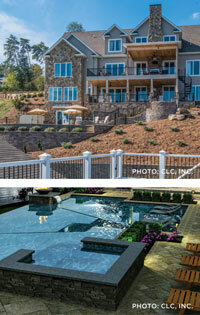 Natural stone: Natural stone can be expensive, but it is one of the most beautiful and popular choices around the lake. 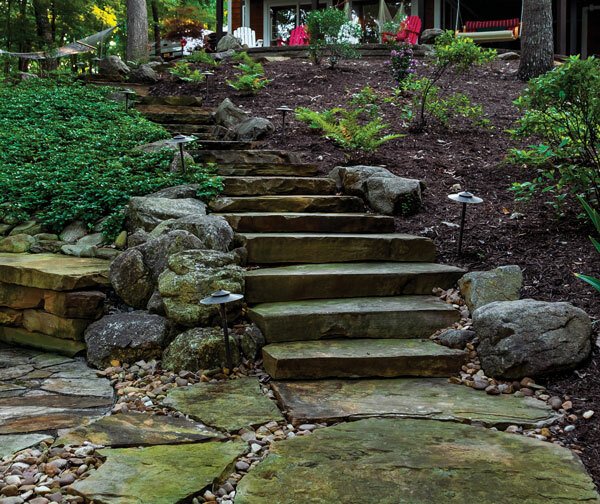 You can make whole paths and stairs out of natural stone, or sink individual stepping stones into grass to create a less expensive— but still beautiful—walkway. It is durable, safe to walk on, and requires almost no maintenance. Travertine: A type of natural limestone, travertine is a favorite for pavers and steps that don’t get hot under bare feet in the summer. Travertine comes in a variety of earth-tone colors and holds up well on slopes. It is a mid-range option for pathways, requires little maintenance, and is unlikely to break over time because it flexes with the ground. Grass pavers: Made of a honeycomb base planted with grass, these pavers are a good option for flat surfaces that get heavy traffic. They are inexpensive and create a beautiful, natural look. However, they can be dangerous on slopes, especially after rain or early in the morning, when the wet grass makes it easy to slip. Gravel: Gravel is a budget-friendly option for pathways around your lake home and can cover a large area of ground for very little cost. However, it can make for treacherous paths on hills and is often unsafe for older visitors who have a hard time moving without assistance. Gravel in sloped pathways can be washed away by heavy rain and needs to be replaced regularly. Wood: Wood has a low up-front cost for stairs and pathways around the lake; however, wood walkways need to be replaced every few years, as they can splinter and rot. Wood steps and rails last longer but still need to be replaced periodically to stay safe. Concrete: Concrete pathways and steps are durable on slopes, and concrete paths are a budget-friendly option if you are planning to use a golf cart to get down to the lake. Since concrete doesn’t flex with the ground, it will eventually crack and need to be replaced. Depending on the slope of your property, bringing in the equipment to pour concrete may be difficult. Stamped concrete pavers mimic the look of natural stone for much less, but require upkeep and resealing. One change that both designers are noticing around the lake is a different kind of planning for the future.